Franklin County is a city journal created by Patricius Maximus that details the development of a region from the planet's creation to the present day. Development is still ongoing. 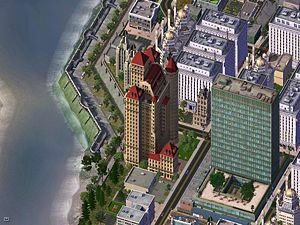 Franklin County was created by Patricius Maximus on 2 June 2008, only 3 days after the Simtropolis Site Hack. It showcases the development of a region called Franklin County from it's creation 4 billion years ago to the present day. There are story arcs within the general plot, which are showcased below. The CJ is in union with 9 others in the Alliance of Fuel Developing and Exporting States. On an earth-like planet which Patricius will not provide specifics on, a region called Franklin County was the home of two freeways, I-30 and I-85, which intersected via a cloverleaf. The first settlers came to what is now Franklin proper, north of the river, and the region snowballed. A peninsula between the Franklin River and Franklin Creek developed into the downtown of the county. Then came the housing boom. Franklin's economy was getting bullish, and a lot of people wanted to immigrate to Franklin County, but there was not enough houses. So they built some. For months, houses were built and the people came in a seemingly endless cycle. As a result of the boom, River Bend, Hanging Cliff, and North Franklin were incorporated. Also during this time a bunch of loners outside the region established East Valley on a plateau. The housing boom eventually died down as job positions were filled up. An interesting development during this time was foreign businesses coming into East Valley. The Citizens' Assembly there voted to order the businesses to vacate. They complied with the order; then the buildings were torched. The rubble is still an interesting attraction along SR-285. Also, many infrastructure projects were completed. The bullish economy wouldn't sleep long, however. A real estate developer came and set up residence in Forest Bluff. He brought a second wave of unprecedented expansion to Franklin County. As a flood of people came in, jobs struggled to keep up. The effects of this second boom is continuing, although it has been sliding for some time. Franklinites had long recognized that East Valley was different from them; indeed, they did have very different origins. The Franklinites and East Valley citizens voted in favor of two proposals: to seperate East Valley from the other cities, and to untify all the others into a metropolitan area. As a Metro area, Franklin has prospered. Soon mid-rises appeared in Central Franklin, followed by high-rises. It currently has a population of more than 40,000 people, with more than that in job openings -- conditions ripe for growth. Patricius maintains a newspaper for Franklin, called the Franklin Chronicles, which is updated irregularly. It has covered many story arcs, as well as covering out-of-region events unobtrusively in updates. A real estate developer arrived in Forest Bluff to develop Franklin for himself. He expanded his own area on Forest Bluff, as well as Hanging Cliff. He even constructed a few houses in River Bend. After making millions, he departed from Franklin Metro, and gave his house to Sedimenjerry for free. The latest and most significant story arc in Franklin County is the Agonus story. A big meteor landed in East Valley, and a scientific team investigated it. They found an eerie regular glow and an unknown element. When they took it to their lab, it exploded due to spontaneous fusion. Astronomers traced the meteor back to an unknown planet. The planet was named 'Agonus', which is derived from the Latin word for 'combine', a reference to the fusion incident. A space probe was sent to Agonus, and it found a eerie, radioactive, barren world. The probe is still in orbit looking for new discoveries. This page was last modified on 5 April 2013, at 04:13.